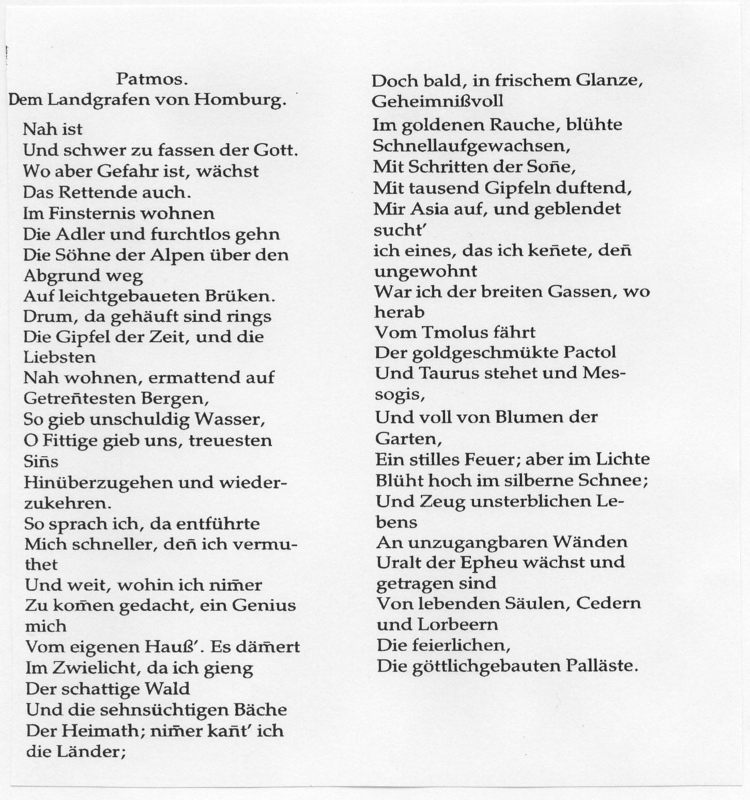 Friedrich Hölderlin dedicated the poem Patmos 1802 to the count Friedrich of Homburg, on whose suggestion he wrote it. On Patmos the Evangelist Johannes wrote the Apocalypse. Hölderlin´s poem circles around the pictures of the revealing. It concerns darkness, transience, death and resurrection. And because the remains of count Friedrich rest here, Horst Hoheisel selected this poem of Hölderlin, dedicated to Friedrich, for the entrance to the crypt of the counts of Homburg in the church of the castle. Because there was no reference to Hölderlin and its stay in Bad Homburg. In the bright church room a plate from bronze locks the entrance to the crypt with the dark metaphors of the first verse of the poem. At the end of each line the plate breaks open and releases the view of a heavy ladder, which down-leads to the crypt. From the foot of the ladder the verses of the poem lead with always becoming brighter metaphors into the darkness of the crypt and lose themselves there in the illegibleness.